As I watched Penn and Teller's new documentary, Tim's Vermeer, I was reminded of the quote from Pixar's The Incredibles - "if everyone's super, no one will be." Implied or not, that is the undercurrent running through the entire film, in which Tim Jenison, an amiable inventor and jack of all trades, who sets out to discover the secret behind Johannes Vermeer's photorealistic paintings. How did Vermeer capture light with such a keen, photographers eye centuries before the invention of the camera? Convinced that Vermeer must have have used some sort of aid beyond the Camera Obscura that is generally attributed to him, Jenison sets out to discover the true method behind Vermeer's genius, and once he does, to recreate it himself. Is a non-painter claiming he can paint a Vermeer the ultimate act of hubris? Or the eccentric musings of a man with a passion for learning? A little of both, it turns out. Jenison isn't a braggart or an egoist, he seems like a pretty down to earth kind of guy who is doing this out of sheer curiosity than to prove any sort of point. And the final results are pretty surprising, although they are sure to infuriate art purists. 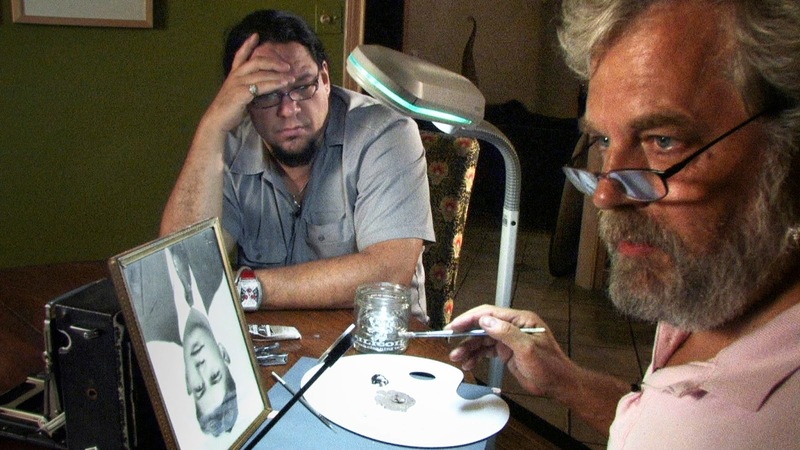 Tim Jenison (right) demonstrates his first painting experiment to his friend, producer Penn Jillette (right). Photo by Carlo Villarreal, © 2013 High Delft Pictures LLC, Courtesy of Sony Pictures Classics. All Rights Reserved. It's an undeniably fascinating premise, however, and the results even more so. Here is Jenison, a man who has never picked up a paintbrush before, but is able to recreate the look and feel of a real Vermeer with the help of an inegenious mirror device that, in all liklihood, is what Vermeer once used to create his masterpiece. So is Jenison an artist on the level of Vermeer? Or was Vermeer a hack, doings something that literally anyone could do if they put forth the time? Unfortunately, the film never quite delves into those questions, choosing instead to focus on the process of Jenison's experiment rather than the philosophical questions it raises. When the film does touch on those questions, it does so almost flippantly, as if the why doesn't matter as much as the how. The result is a film that feels more like an episode of "Mythbusters" than a feature documentary. The narration by Penn Jillette is almost too jovial for a film with real philosophical underpinnings, and while the filmmakers were clearly going for a more lighthearted tone at times, it often seems at odds with what's actually going on. Tim's Vermeer comes across like a television special, a middle of the road documentary about an interesting concept that would have done just as well with a documentary short. As is, there's just not enough here to justify a full length documentary, filling in gaps with long stretches of Jenison painting and building his sets; time which could have been better used by examining the implications of Jenison's work that are so blithely glossed over. 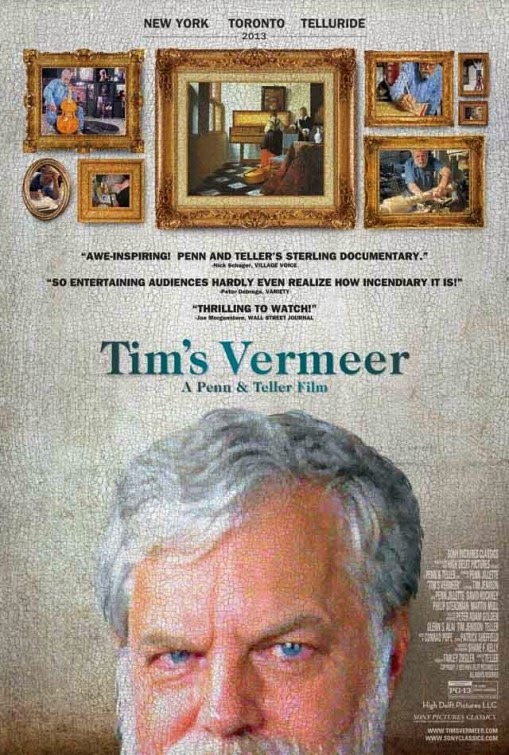 TIM'S VERMEER | Directed by Teller | Featuring Tim Jenison, Penn Jillette | Rated PG-13 for some strong language | Opens today at the Manor Twin in Charlotte, NC. Blu-ray Review | "Drums Along the Mohawk"
Blu-ray Review | "The Jungle Book"